Words and pictures can only give you half the story. The best way, the only way, to really appreciate what makes us special is to come visit us! Whether you attend an Open House or simply contact us to arrange your own personal visit, you will always be welcome. Once you’ve felt the energy of the school, seen the quality of our facility and met the students and teachers who make it such a warm and vibrant place in which to work and learn, you will be confident that your child will have a successful academic journey at Nazareth. Information regarding tuition, applications, tours and shadow days is listed below. We look forward to meeting you and your child! In addition, $150.00 security fee for each FAMILY. Other book bill and fees may apply. For full tuition policy, please click here. Update for 2019-2020 will be available soon. We welcome parents to visit the school at any time during the school day to take a guided tour. Tours can be scheduled from 8:15 am - 2:00 pm. There is so much to see and learn about at NAGS on any given day. Meet our teachers and see our students in action! Students entering grades 2 - 8 are required to shadow in their prospective grade for a regular school day. Your child may wear casual clothes or their current school uniform. This is a great opportunity for your child to meet future classmates and teachers! Please call Mrs. Rovnan at 215-637-7777, ext. 200 to take a tour and/or a shadow day for your child. Students wishing to enter Nazareth Academy Grade School for First Grade are expected to complete the Readiness Evaluation administered by the faculty at the school. The evaluation is offered in February preceding September enrollment. If a child is scheduled for an evaluation after the February date, they may be required to complete an additional part. This additional component may be given especially if the evaluation date is much later in the school year. It will further test the knowledge of sight Vocabulary and Reading. The Readiness Evaluation is a guide used by the Administration and Faculty with regard to admission to Nazareth Academy Grades School. It is not the sole basis for admission. Other factors are considered, such as recommendations from the student's Kindergarten teacher. Parents are welcome to remain at school during the Evaluation to view a Video Presentation and tour the school if interested. The fee for the test is $25.00. Please make check payable to "NAGS"
Submit Birth Certificate and Baptismal Certificate (if applicable) along with your check. 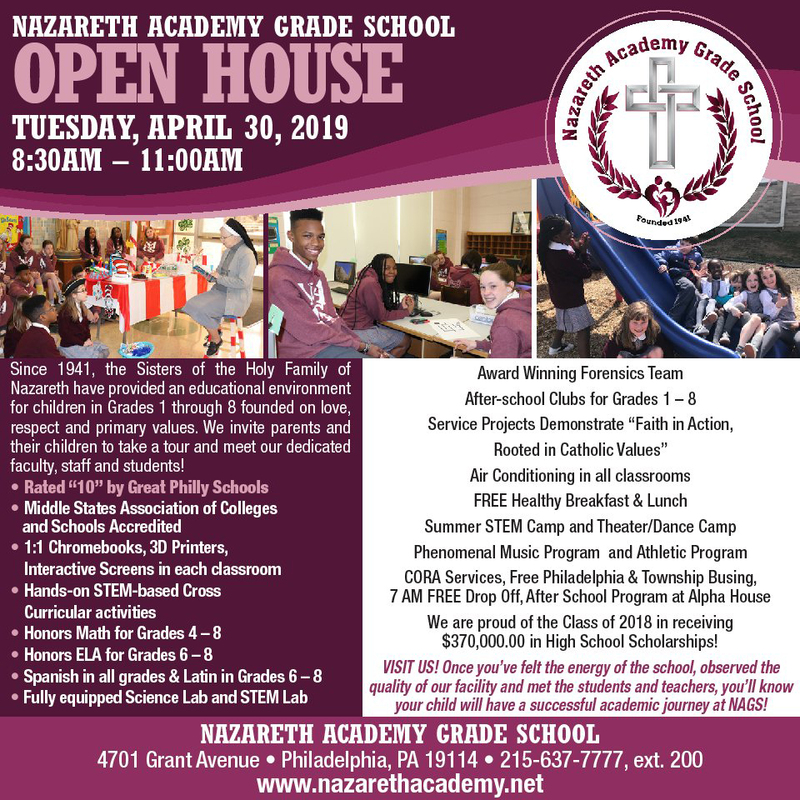 We look forward to welcoming your family to Nazareth Academy Grade School ! 1. Copies of last three report cards, if applicable. 2. Results of the most recent standardized tests, if applicable. The student will also be asked to take an evaluation on the shadow day. A $25 fee must be paid to take the readiness evaluation for the grade to be entered. Our students are eager to welcome new students! Parents should be at ease in knowing that our faculty and students will warmly make your child feel "at home" at NAGS! If summer work or tutoring is required, the student is accepted on the condition that the work is completed. All students in Grades 2 through 7 are accepted on the condition that they maintain all grades at each marking period at "70" and above (Grades 3-8) and "S" and above (Grade 2). While we welcome interested families to come tour the school at any time, we have also planned several Open House events during the 2018-2019 school year. Please join us! Kindergarten students and their families were invited to attend an Open House on November 30, 2018. The opportunity to meet our teachers and tour the school was made avaliable to all interested parents. All current families and families interested in touring the school were invited to either of two seatings for our Spaghetti Dinner on February 1, 2019. Incoming first grade students registered and participated in a Readiness Evaluation on February 9, 2019. If you missed this date, you may register for the evaluation online or please call Mrs. Rovnan at 215-637-7777, ext. 200 to arrange the evaluation. There is a $25.00 fee for the evaluation. Our spring Open House will be held during the school day to provide an opportunity for interested families to meet our faculty and students. Join us from 8:30 AM - 11:00 AM to meet our administrators, faculty, students and staff! Thank you for your interest in Nazareth Academy Grade School. We are committed to promoting academic excellence by creating an environment of love which motivates each student to grow and develop to his/her full potential. No child shall be denied admission on the basis of color, race, creed or nationality.